Assoc. Prof. Valentin Savchev has been Head of the department of Fine Arts since 2011. He is a graduate of the Vocational School of Ceramics and Glass in Sofia (1974). He received an MA in sculpture from the National Art Academy under prof. Iliya Iliev in in 1982. Assoc. Prof. Valentin Savtchev works in the field of small plastics and decorative monumental sculpture. He also works with a number of durable material sculpture techniques, such as bronze casting, stone and wood. Objects and projects of arts of his adorn parks and memorials all over the country. Valentin Savtchev is a member of the Union of Bulgarian Artists and the Among Colleagues Club and participates actively in art exhibitions both locally and internationally. His works may be found in private collections in Bulgaria and abroad: USA, China, France, Italy, Austria. He has five solo exhibitions at home and abroad. Assoc. Prof. Valentin Savtchev has been teaching painting and sculpture at NBU 1996, initially within the Theatre Department and later on in the newly created department of Fine Arts. In 2006 he was director of Plastic Arts within the department of Fine Arts. 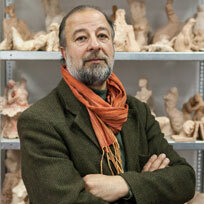 In 2010, he was appointed Associate Professor in sculpture with a dissertation on the Role of confinement in sculpture. Assoc. Prof. Valentin Savchev participates actively in the cultural life of the NBU and art events of the department of Fine Arts.